The systems of RHENAC GreenTec AG offer completely new perspectives for green keeping in football stadiums and other grass sports facilities. With our LED lighting systems developed on the basis of scientific research, lawn can be regenerated in light deficient sports grounds and during the dark winter months. Since 2013 the interactions of LED light and climate on the development of very different types of lawn have been investigated in cooperation with the TU Munich. The results of the research are continuously incorporated into the further development of our technology. The lawns in the football stadiums of the Bundesliga are exposed to the highest mechanical loads. 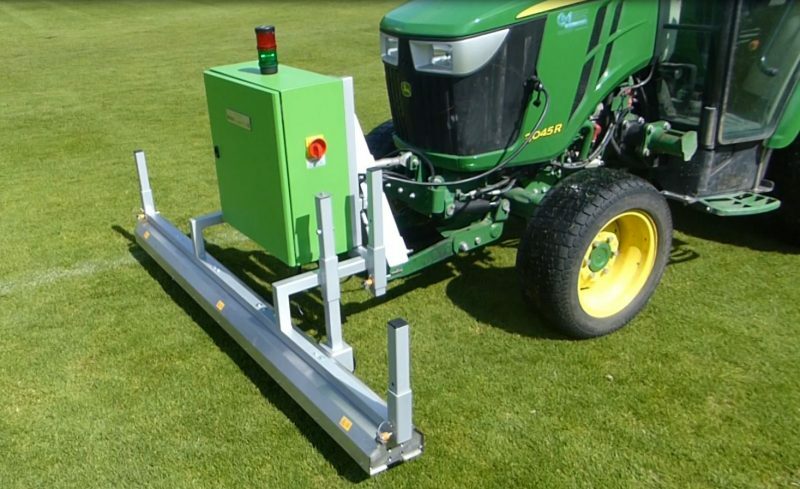 Quick starts, stops and turns during the game damage the turf and the increased utilization of sports arenas for concerts and other events make regeneration of the lawns more difficult. To maintain the quality of the sports turf throughout the season, elaborate care measures are required. Artificial light sources are essential to supplement constructive as well as seasonal illumination deficiencies. In cooperation with RHENAC GreenTec AG, Scientists at the Greenhouse Laboratory Center at the Weihenstephan Science Center of the Technical University of Munich have been studying the effects of different light sources on lawn species since 2013. It could be proven that modern LED technology is suitable not only to replace the previously used exposure systems, but also to improve the quality and efficiency of lighting with significantly reduced energy consumption. Our individual lighting concepts for optimizing lawn growth and quality in stadiums or other grass sports facilities such as golf courses are developed on the basis of extensive analysis. Availability of natural light, daylight spectra, temperatures and wind directions as well as other environmental factors at the customer‘s site are taken into account as well as the intensity of use. The results obtained are evaluated and stored in a database to serve as the basis for the development and implementation of the necessary care measures, which we develop together with the responsible greenkeepers. The fully automated lawn cultivation systems R-BL 7500 plus and R-BL 3500 plus light work without any contact to the turf. The base frame and the main truss of the system are parked behind the goal area, counter bored or lifted. A manual assembly and disassembly of the system or the complex displacement of light-carrying units is completely omitted. Therefore labor costs for handling and operation are significantly reduced. 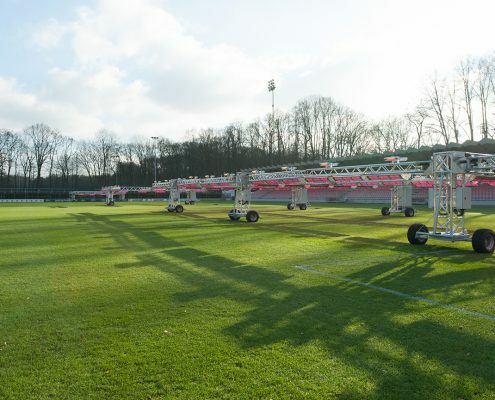 The LED lighting system for fully automated sports lawn care is freely programmable – light intensity, light composition and exposure area can be precisely programmed and controlled as required. For example, the light composition can be optimized for improved germination or for tillering after the transition from young plants to robust turf. 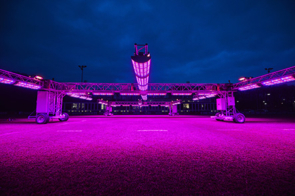 Depending on the system, the mobile semi-automatic turf units consist of up to six LED light carriers of five to ten meters in span, which are mounted on a main truss. The main truss is mounted on a drive axle with wheels for variable movement on the field. The light carrier units are attached to the right and left sides and can be deployed. The modular system allows customized configuration of individual mobile light carrier. In addition, the systems can be interconnected and these larger units can be operated together. The light spectrum is variably adjustable for all mobile units. Each light carrier comes with an infrared heating unit. In addition to the underground lawn heating this creates an optimal lawn temperature, which allows lawn growth even in winter. Both functions – illumination and infrared heating – are operated as additive systems. Environmental conditions like natural light intensity and spectra as well as temperature are measured at the turf level. Only the light or temperature intensity required by the system to produce optimal growth conditions is added. If requested, an irrigation system can be integrated (not available for R-ML 40). 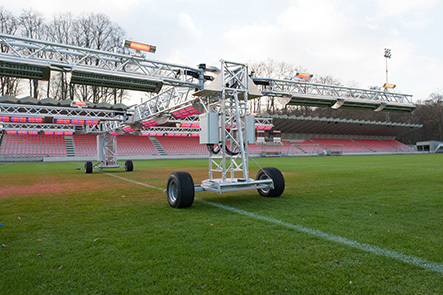 The largest mobile unit consists of a main truss with six light beams, each up to twelve meters in length. This corresponds to a cultivation area of 360 square meters. The system is similar in design to the R-ML 360, the light carriers are eight meters long. This corresponds to a working area of 240 square meters. The system has three light carrier units to the left and right of the main truss. The work surface is 180 square meters. The small units were developed for additional exposure or intensive treatment on heavily used lawn areas. All systems are equipped with freely programmable LED light units and IR heating systems. The controller can be used to program light intensity, light composition and exposure time. Likewise, daily and weekly programs can be stored. The IR heating system is freely programmable and can be controlled via a sensor. The LED systems are low maintenance and designed to allow quick replacement. Even the LED modules can – if necessary – easily be replaced with other light spectra or perhaps even more powerful LEDs in the future. We guarantee high availability and long-term use at all times. Persistent humidity, long periods of drought or extreme temperature fluctuations can provoke various lawn diseases. Rapid diagnosis and immediate action are important to fight the spreading of the disease. RHENAC GreenTec AG relies on the germicidal effect of UVC light. Irradiation with this very high-energy light triggers a photochemical reaction that can be used to specifically damage or kill microorganisms such as bacteria and molds. With the Rhenac mobile device R-EET-0200 for UVC fungus protection, the lawn can efficiently be irradiated and the development of fungal spores is reduced. The device is moved across the lawn by a tractor. The lighting unit derives its energy either directly from the tractor or from its own generator set. The intensity of the lighting is controlled by the distance to the turf; the correct driving speed of the device is specified acoustically. To mark the lane, the system is equipped with a foam spray device. This avoids that the respective grass track is repeatedly irradiated with UVC light. The sporting ambitions of our clients may be different, but all clubs want to play on perfect lawn. The causes for a sub-optimal or even poor state of the green can be very different. After a thorough analysis of the various parameters, we develop the right solution together with our customers.